NTP is a top rated Google Adwords expert! We are a Google AdWords Certified Partner, trained to provide your desired ROI results. We have set up and successfully managed millions of dollars worth of Google ads over the last 15 years. Google has recognized us as an AdWords certified professional, meaning that we’ve passed multiple exams that assess product expertise. We are qualified to help you grow your business on the web using Google AdWords. Place your trust in a professional with a 25-year career in the online environment, marketing and consulting. Today, Google AdWords is a vital part of many successful online businesses. If you’re unfamiliar with Google AdWords, it’s simply a pay-per-click service which allows you to create and run ads for your business. These clickable ads are then displayed in Google’s search results. By using the right keywords for your target audience, you’re already ahead because you’re reaching people who have an interest in your product or service. Here are the five main reasons why your business should use AdWords. One of the main advantages that online marketing has over traditional marketing channels, like TV or print, is that it’s extremely easy to measure. This is probably one of the best resources you have to measure what’s working and what is not. Narrows your audience – You can have it set up so that you can discover your audience by their location, the time of day, their language, and even their browser or device they’re using. Access to non-search sites – Gmail, YouTube and lots of other of partner sites are at your fingertips. A huge drawback with SEO is that it can take months before you notice any results thanks to competition and the time it take to “prove itself”. This is not the case with AdWords. Once your Google AdWords campaign goes live, ads will appear and you’ll get instant results, like visitor data. I personally love SEO and think having an SEO plan is a key to part of your online success. That being said, PPC will get you to the top of the search results in minutes. Google is constantly improving AdWords because it’s one of its primary sources of income. Along the way Google noticed that product listing ads and in-video ads on YouTube get more clicks from users. These engaging ads mean more revenue for Google, and advertisers as well because of new ad formats and extensions. Here’s something that’s really awesome about Google AdWords. You can set a maximum cost per day for your campaign. How does this help your business? It allows you to budget your campaign accordingly without worrying if you’re going to go over budget. The worst case scenario is that the amount of ads will begin to decrease as your budget gets lower. However, you can increase your budget accordingly. This scalability is a nice option if you want a lot of leads in a short amount of time. Because of the speed of Google AdWords, when compared to SEO, you have a major advantage of your competitors. Because you’ll already be appearing in search engines, your site will be receiving more clicks from search results than all of the other companies in your industry. But, what if you’re competitors are also using AdWords? That’s not an excuse. Today 80% of search results now contain AdWords ad placements. Furthermore, those ad placements are covering as much as 85% of the space above the fold on the results page. This doesn’t just mean that Google is making a hefty profit, it illustrates that AdWords are being used by more and more advertisers. So, the only way to beat them is to join them. 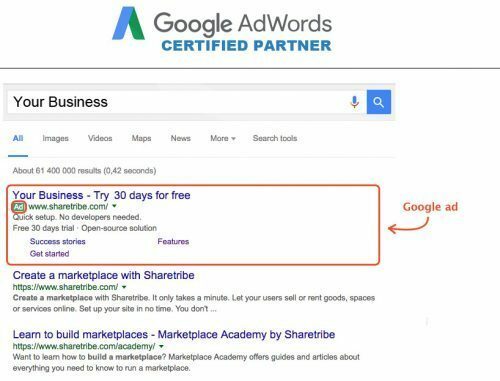 Learn How We Can Put Google AdWords To Work For You Today!